SAN FRANCISCO — Gallery Wendi Norris is pleased to announce The Collected, the first solo exhibition of paintings by Amir H. Fallah. Drawing inspiration from not only the subjects of Renaissance portrait and vanitas paintings, but also the economic models in which those works were produced, Fallah’s exuberant compositions also incorporate distinctly contemporary visual concerns. Commissioned portraits traditionally involve visual symbols indicating the power, influence, and sophistication of their subjects. Portraits in “The Collected” have been commissioned and thereby sold before the opening of this show, which is a business reality rooted in traditions from medieval ateliers and modern galleries alike. In the style of such historical masters as Holbein and Ingres, Fallah went into each collector’s home to select personal mementos, souvenirs, and other objects to appear alongside his subjects to create each portrait. The Laws of Order (2012) includes a bongo drum, various houseplants, a knife, and a picture in a frame, among other items belonging to its subject. In Fallah’s works, however, these items take over the picture, and the identity of each subject must be pieced together through these symbolic clues. This is because Fallah drapes each subject he works with in blankets, obscuring their faces, forcing his or her possessions to the foreground. Improvised, colorful abstractions also decorate each composition. While of course the collectors are necessary collaborators in this process, Fallah’s portraits address issues of identity, economics, and artistic agency in a distinctly contemporary manner. 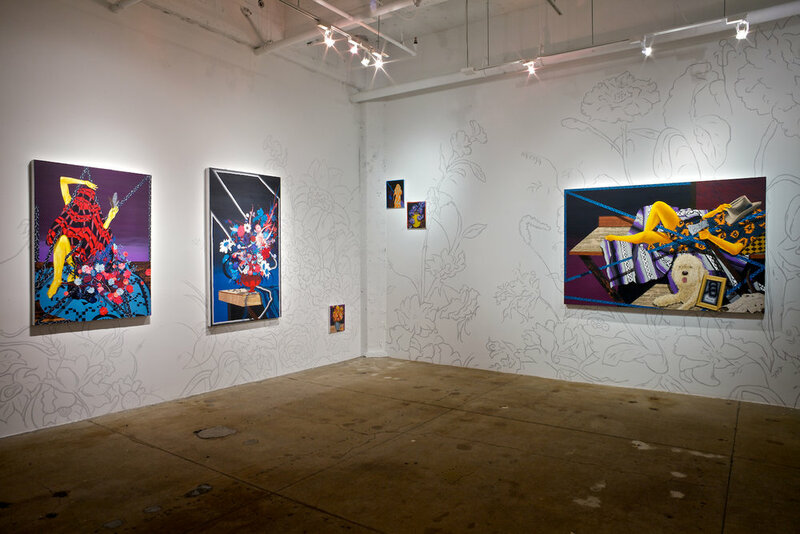 Similarly, Fallah’s wildly lush paintings of flower arrangements harken back to the old tradition of depicting objects of fleeting beauty to evoke thoughts of life’s brevity and fragility, but complicate the straightforward symbolism of the Dutch masters with color, abstraction, and other formal strategies. A contemporary merry prankster, Fallah’s depth of knowledge and painterly chops enable him to investigate serious issues about art, painting, life, and human power relations with adventurous wit. Amir H. Fallah holds an MFA from UCLA and a BFA from MICA, Baltimore. He has had solo exhibitions in New York, Dubai, Miami, California, and been included in the 2011 Sharjah Biennial and in group shows at the Weatherspoon Art Museum and the University Art Museum at CSULB. He has been awarded the Jacob Javits Fellowship, and been featured in such publications as Frieze, Whitehot Magazine, The LA Times, Artweek, and the Boston Globe. He has been a visiting lecturer at a range of respected institutions, including Columbia College, USC, UCLA, Cleveland Institute of Art, California State University, University of New Mexico, Otis College of Art, and Maryland Institute College of Art. He is the founder and publisher of art and design publication Beautiful Decay.